“It’s My Obsession” For international rocker Phil Collins, the Alamo is personal. Legendary rock musician Phil Collins doesn’t exactly believe in psychics, but he has to admit, he feels eerie about this: A clairvoyant once told him he was the reincarnation of John W. Smith—an Alamo courier who went on to become the first mayor of San Antonio. She didn’t know that the very first item in his vast Alamo collection was an 1836 receipt for Smith’s new saddle just weeks after the Alamo siege. That isn’t the only thing that spooks this retired British musician who has just donated more than 200 Alamo items—worth some $15 million—to the Alamo in downtown San Antonio, Texas. The fascination with the pivotal battle in the Texas Revolution began in the 1950s, when Collins was growing up in London and watched the 1954-55 Disney miniseries on Davy Crockett, played by Fess Parker. Collins started reading whatever he could find about the 13-day siege in 1836 that killed roughly 250 Texian defenders (almost to a man) who fought approximately 2,300 Mexican soldiers under the command of Gen. Antonio López de Santa Anna. He was getting rich about the time he saw his first memorabilia item tied to the battle and its participants—a David Crockett letter in a Georgetown shop he spied while shopping with his first wife in Washington D.C. “But they wanted $60,000 for it, and it was too expensive,” he says, noting his mother taught him to be more frugal than that. Several years later, his third wife gave him the Smith receipt that would begin the world’s largest private collection of Alamo artifacts. The collection grew so large that he created a state-of-the-art museum inside his home in Switzerland. That Smith receipt is still one of his favorite items. But he lists the “jewel in the crown” as the David Crockett musket, with two powder flasks, musket balls and a musket pouch he bought from the José Enrique de la Peña family of Mexico. Their ancestor was a lieutenant colonel in the Mexican army whose diary, published in 1955, created an outrage when he wrote that some had surrendered in the end, including Crockett. American historians—and movies and books—insist Crockett was killed fighting to the end. But the dueling stories make the musket a controversial item and a special piece of Collins’ collection. “I’ve bought a lot of my collection from Mexico,” he says, sharing how Mexican soldiers who survived the Battle of the Alamo took home the “spoils of war,” from boots to weapons. Collins also helped dig for Alamo artifacts beneath the History Shop at 713 E. Houston Street, opposite the north wall of the Alamo compound. Jim Guimarin, who owns the antique map, weapon and book shop, showcases Mark Lemon’s model of the Alamo created for his book, The Illustrated Alamo 1836. When the author had to sell it because he needed the garage back, Collins bought it so it could be temporarily stored at the History Shop. The hope is that the model will make its way to the Alamo too. “The real story of the Alamo is less black and white than the movies present it,” he says. He points out that this land was part of Mexico at the time, and Santa Anna had invited settlers to till the land. The first settlers did, following Mexican law, but then word got out that Mexico was giving away land and that created a surge that led to the demand for independence. While one would think the collection should obviously end up at the Alamo, Collins reveals that it was actually a fluke. 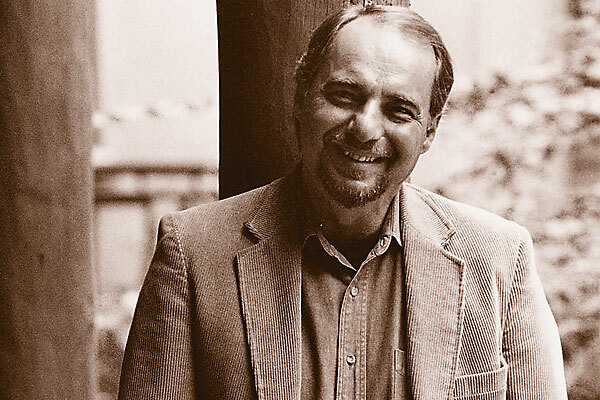 “I’m sure Phil was wondering what the heck I was doing there to begin with, but just assumed his friend and History Shop partner Jim Guimarin was just being nice and invited me. Phil was very relaxed and enjoying his favorite, cheese enchiladas, when Jim asks, ‘Kaye, do you have something you want to ask Phil?’ I was just inhaling a big spoon of soup, and it almost ended up everywhere! He, of course, said yes. Later on, Texas officials told Collins he could be as involved as much as he would like, from delivering the collection to being completely involved. “Completely involve me,” he told them, and their agreement notes he will be consulted on how his collection is displayed. So what does someone obsessed with the Alamo do after he’s donated a vast collection to the Alamo? He’s known all these years that he’s not just collecting “treasured heirlooms,” but is collecting “real history,” he says. That history speaks directly to brave men fighting for what they thought was right…and left an imprint on an entire nation. Jana Bommersbach interviewed Phil Collins for this article. His book, The Alamo and Beyond: A Collector’s Journey, is available as a signed, limited edition from State House Press. Please visit TFHCC.com to purchase. 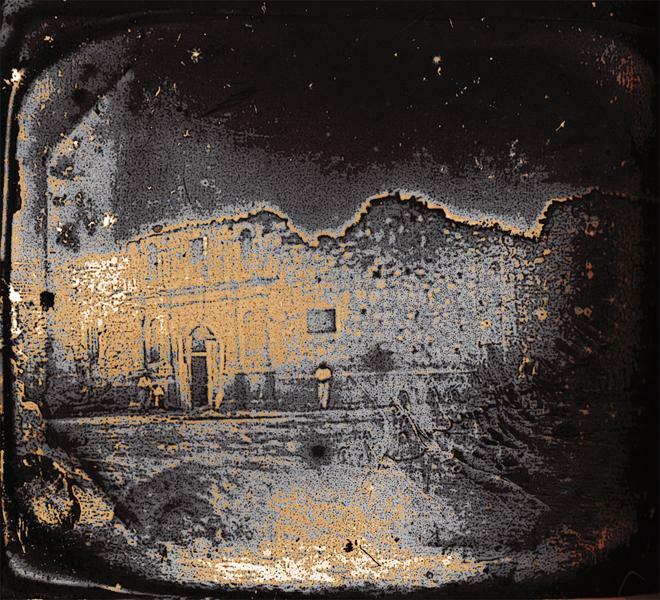 The earliest known photograph of the Alamo, this daguerreotype was taken before 1850, roughly 100 years before Phil Collins first fell in love with the Alamo. Historians estimate approximately 2,300 Mexican soldados attacked the mission during the 13-day siege in 1836 that killed, almost to the man, the roughly 250 Texian defenders. 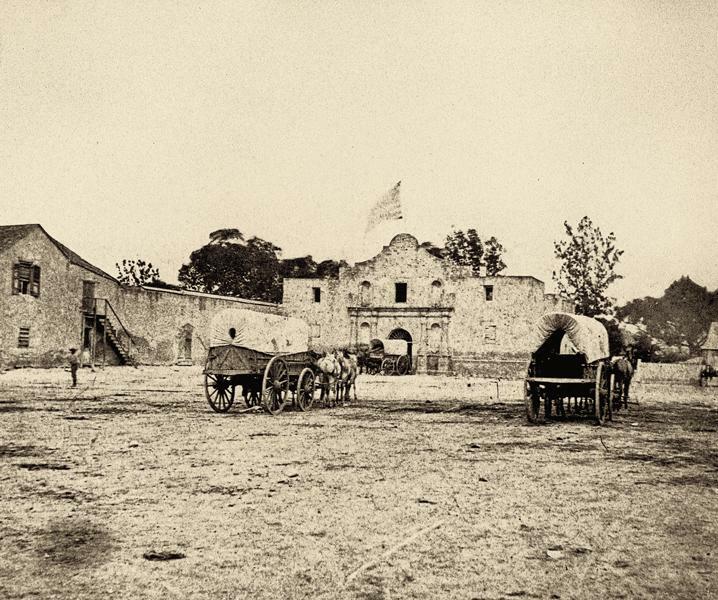 This photo of the Alamo was taken after the U.S. Army modified the front of the building to include the famous “hump.” Because of the Alamo’s placement in downtown San Antonio, Texas, the mission has changed with the city. All that is left of the main compound today is the church and part of the long barrack (or convento). This past October, the Texas General Land Office spent nearly half a million dollars to give the 1700s long barrack a new roof. 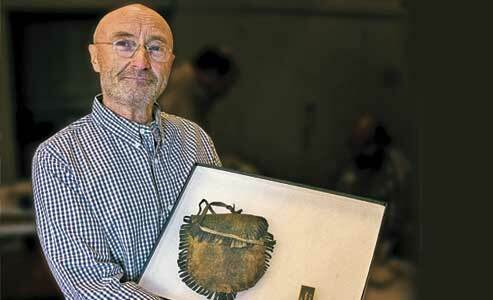 Phil Collins holds a leather hunting pouch that originally belonged to Alamo defender David Crockett. He told True West that his most prized Alamo collectibles are this pouch and Crockett’s musket (top). 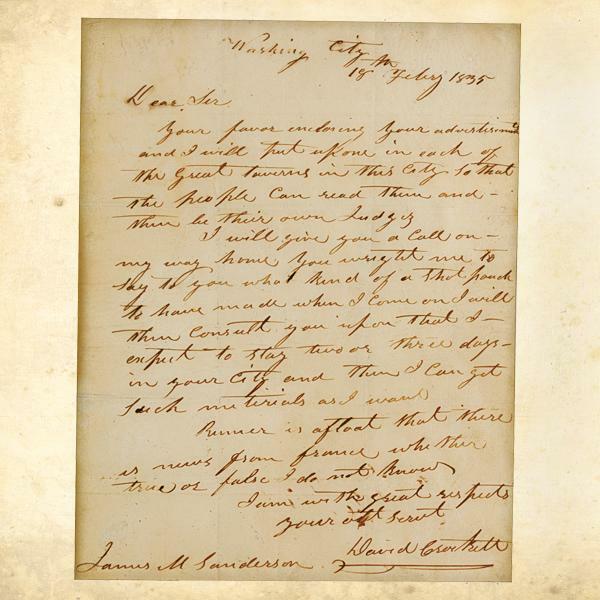 On February 18, 1835, David Crockett wrote this letter, ordering a new shot pouch from James Sanderson, a supplier of arms in Philadelphia, Pennsylvania. This may be the pouch that accompanied him to Texas, which Phil Collins holds in the 3rd slide. Phil Collins isn’t the only celebrity obsessed with David Crockett. Hollywood director, writer and producer David Zucker includes a reference to the Alamo defender in all of his movies. He places a picture of Crockett (see the above 1834 print) on a wall in most of them. Zucker even played Crockett (inset) in his movie The Naked Gun 2½. Believed to have been owned by James Bowie, this folding boot knife may look like a penknife, but it measures close to 20 inches in length when fully opened. 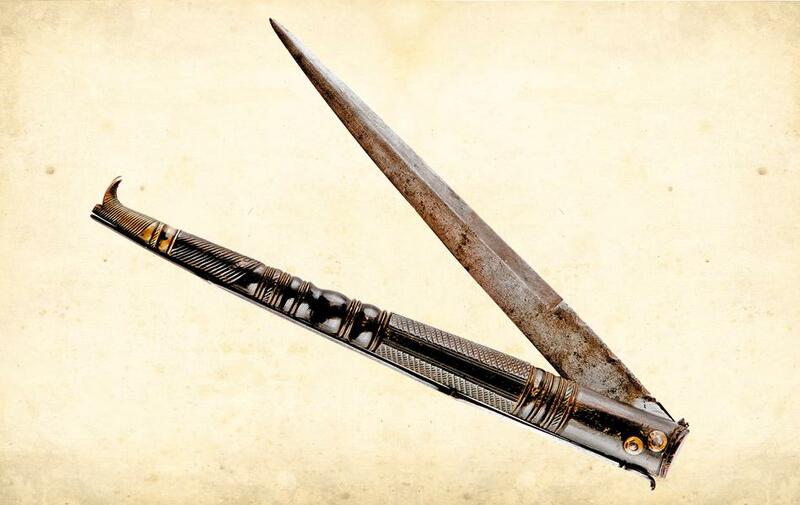 The nine-inch-long stiletto blade would have been a terrifying weapon, as it could deliver a fatal jab. Although the handle features a decorative boot, this knife was probably not put on display, but concealed in the inner breast coat pocket. 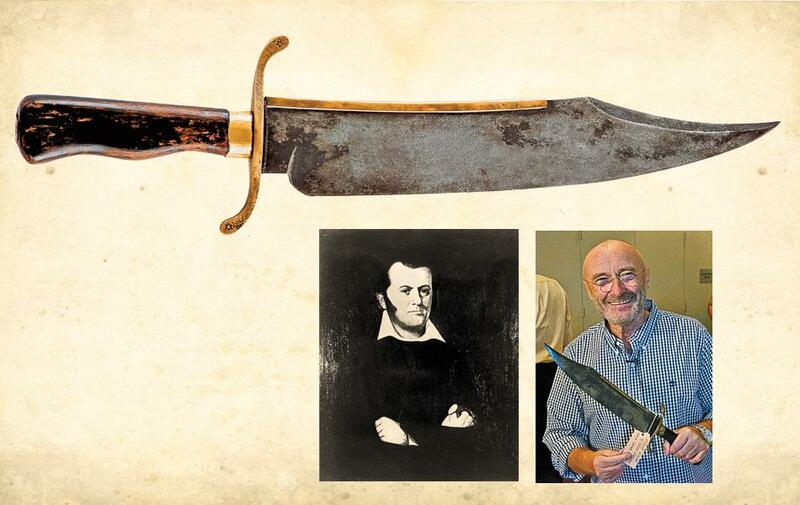 The former lead singer and drummer of Genesis, Phil Collins holds the Bowie knife (far right), crudely engraved with “Jim Bowie,” from the Jesse Robinson Collection. Robinson, who fought with Bowie at the Battle of Concepción and the Siege of Béxar, reportedly got it from Bowie (left) himself. 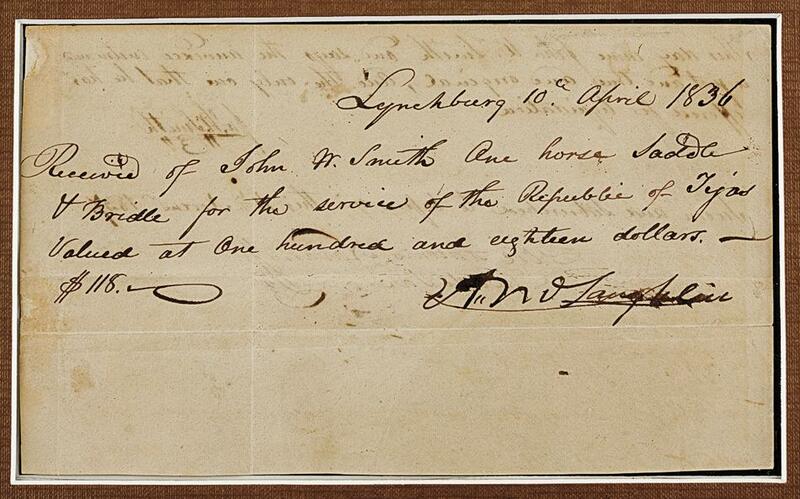 The first Alamo memorabilia collected by Phil Collins is this 1836 receipt for a saddle purchased by John W. Smith, who carried Lt. Col. William Barret Travis’s last letter and other messages out of the besieged Alamo. 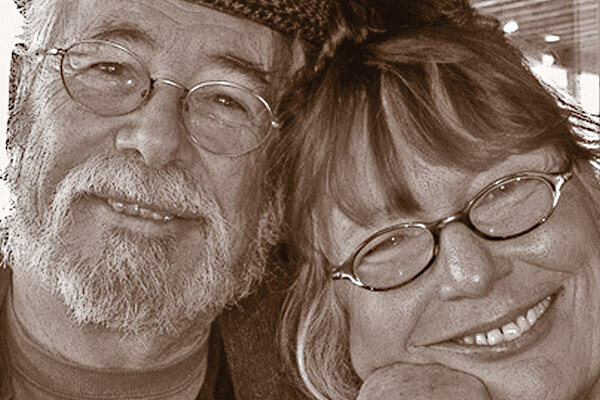 “That just blew me away,” Collins reported in his book. “The miles that saddle had been ridden with Alamo messages was quite overwhelming.” Travis died in the battle, at the age of 26. 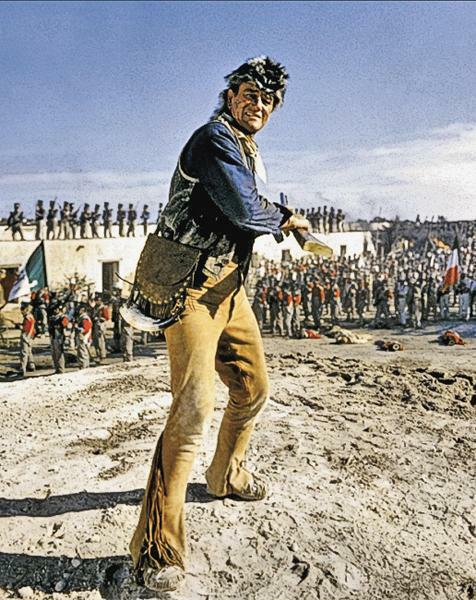 John Wayne was another celebrity fascinated by the Battle of the Alamo. By 1954, the actor had decided to make a movie about it. But he feuded with Republic about the picture. Under his own production company, Batjac, and along with United Artists, Wayne finished the movie. 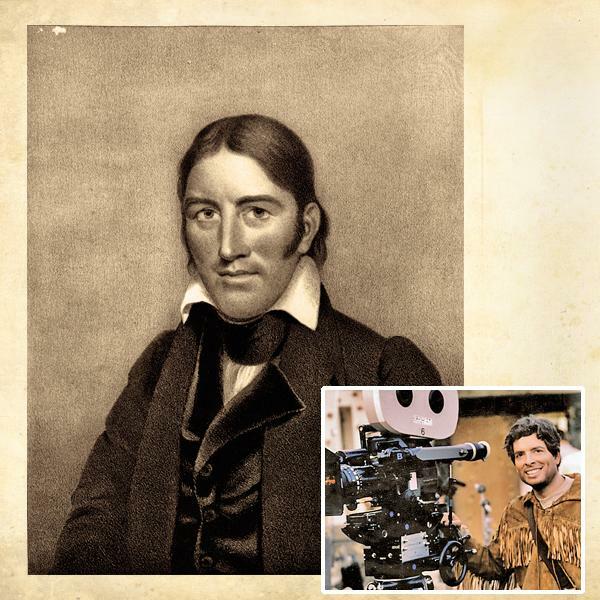 He starred in the 1960 box office hit as Davy Crockett. This Mexican cavalry soldier’s helmet with a tricolor pompon, in the Mexican colors of red, white and green, comes from the Dolores Regiment, 1833-39, which was present at the siege of the Alamo. Once the new museum is built at the Alamo, visitors will be able to compare the real thing to depictions seen in artworks, such as Dave Powell’s drawing of a Mexican cavalryman hunting down an Alamo escapee (left). 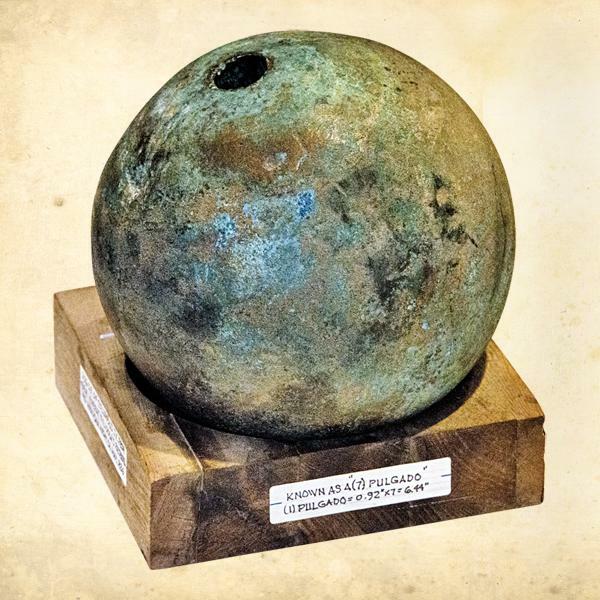 On this Mexican howitzer cannon shell, you can see the hole at the top where soldiers would pour blackpowder and then plug the hole with a piece of wood. The soldiers then lit a fuse on the plug and dropped this into a cannon for firing. 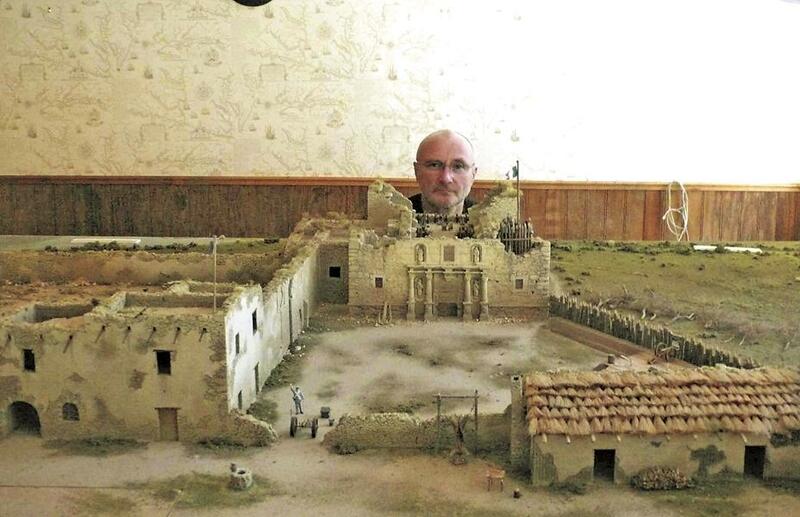 Collins saved Mark Lemon’s scale model of the Alamo from being lost to history. He endorsed it and Lemon’s book as “a great pictorial look at what the compound might have looked like in 1836.” Visitors to San Antonio can see the model at the History Shop on E. Houston Street. 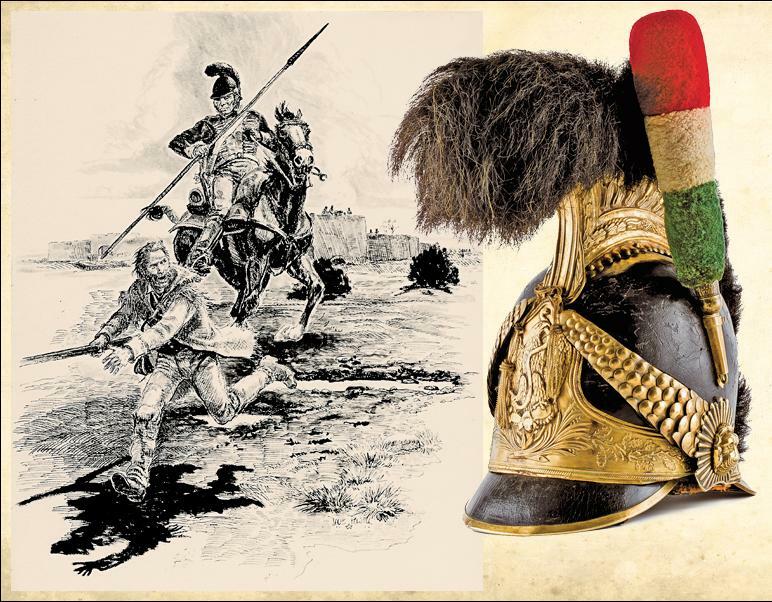 Narration by the rock star helps walk you through the story of the historic battle! 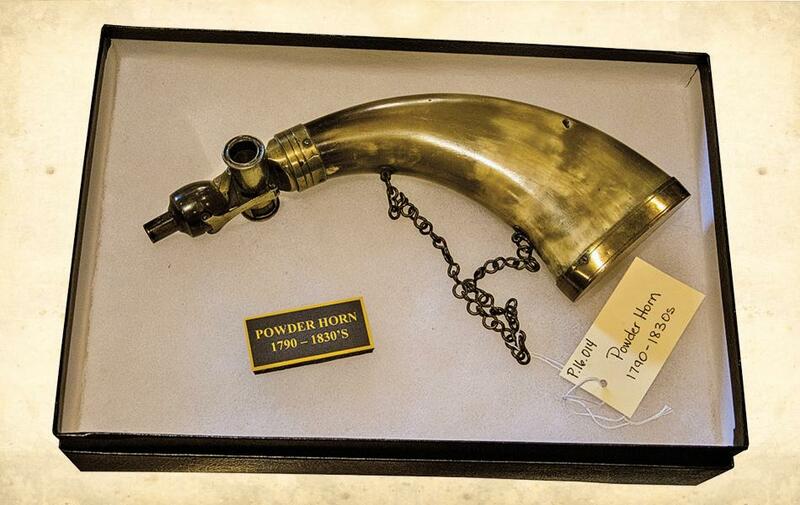 This powder horn, which carried blackpowder used for firing rifles from the late 1700s to the mid-1800s, is particularly interesting and valuable because of its pristine condition and the fact that it still has a small piece of glass in the dispensing nozzle. 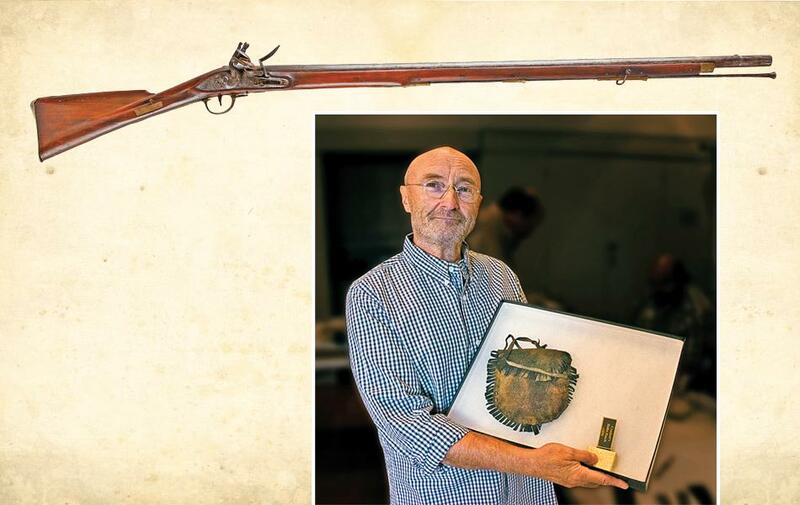 Phil Collins calls this Sapper’s Great Axe his most “chilling” Alamo collectible. Weapons like this one saw service during the Napoleonic wars before finding their way into the Republic of Mexico Army. Mexican Zapadores (sappers) could have used this axe at the Alamo to help them breach the mission’s North Wall and advance on the enemy Texians. 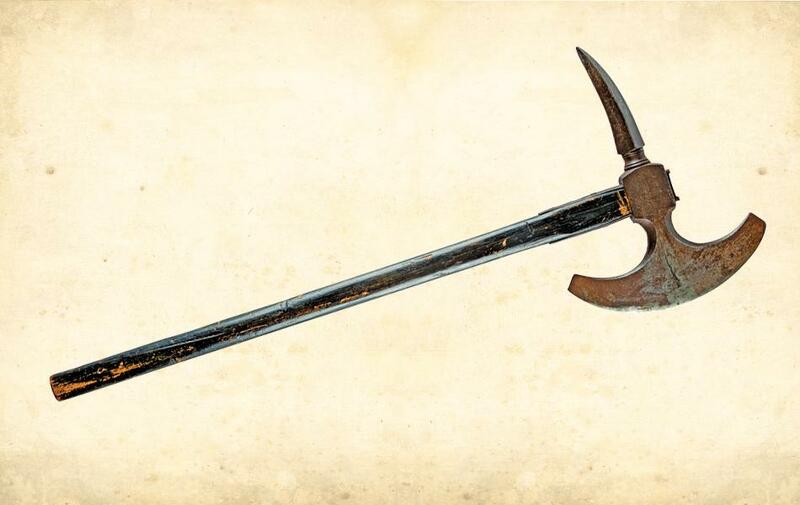 Who knows if a Mexican soldier used this in the hand-to-hand, face-to-face bloodbath that broke down the Texian resistance? 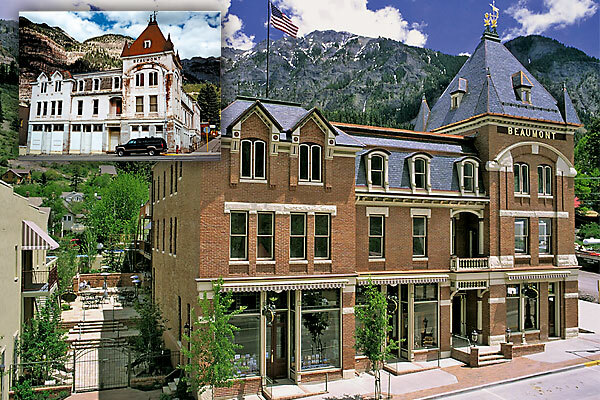 The Kings of the Beaumont Reopening Colorado's "Flagship of the San Juans."